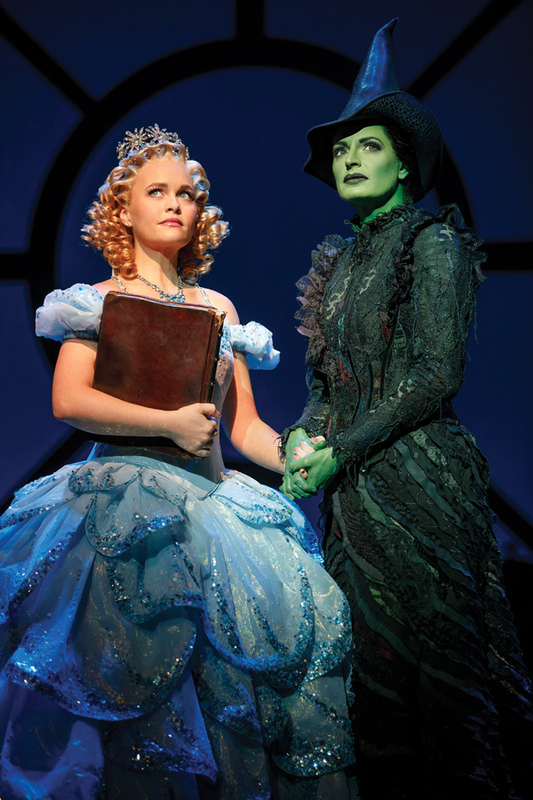 Amanda Jane Cooper (left) and Jackie Burns star in Broadway’s “Wicked.” For the second year in a row, Northwestern ranked seventh in Playbill’s list of the most represented colleges on the Broadway stage. Open any Broadway playbill right now and there’s a decent chance you’ll find a Wildcat’s name somewhere inside. For the second year in a row, Northwestern ranked seventh in Playbill’s list of the most represented colleges on Broadway. Playbill listed 16 NU alumni who are gracing the stage in the 2017-18 season, performing in shows all along the Great White Way –– “Anastasia,” “School of Rock,” “Hello, Dolly!” and more. New York University topped the ranking and Boston Conservatory tied with NU for the seventh-place spot. Communication Dean Barbara O’Keefe said two factors make NU’s theater program stand out. NU has been a “powerhouse” in the theater world since the 1920s, O’Keefe said, and has continued to adapt to changing patterns in the industry. Early on, the program focused largely on acting without much music and dance training, she said. Over time, music, dance and other skills like circus arts have become important factors to be competitive in the theater business. When emeritus Communication Prof. Dominic Missimi began teaching at NU in 1980, he said he began to see growing demand for expanded education in aspects like voice and dance training. In response to the trend, he created a Music Theatre Certificate program in the School of Communication. Today, about one quarter of the students in the theater program are pursuing the music theater certificate, said Communication Prof. Harvey Young, chair of the theater department. Musicals — as opposed to other plays — tend to create more opportunities for younger artists, making music theater a promising pathway for students right after graduation, Young said. In recent years, NU’s theater department has focused on encouraging diversity and inclusion, Young said. He said the theater world at large is engaging with a “more diverse palate” of works, citing the success of “Hamilton” as an example of Broadway striving to be more inclusive. As theater alumni move into this multicultural industry, Young said he believes it is important that students study and produce works by artists with different backgrounds, like female playwrights and artists of color. Over the years, though, the “backbone” of NU theater has been consistent, said Communication lecturer Mary Poole, who has been at NU since she began attending graduate school in 1974. The program maintains high standards for its student actors and a curriculum designed to educate rather than just train “cookie cutter” actors, she said. Many of the schools ranked on Playbill’s list — including Carnegie Mellon University and The Juilliard School — have conservatory programs that focus almost exclusively on theater. The theater program at NU, however, offers a liberal arts education with a wider scope. To complete a theater major at NU, students must complete 18 units of distribution requirements in addition to their core theater courses, according to the School of Communication website. Missimi said he sometimes feels NU’s lack of a music theater major means the school loses potential students who really want to “eat, sleep and drink music theater.” Still, he believes the liberal arts education produces well-rounded performers. The theater department has no plans in the near future to turn the music theater certificate into a full major or minor, O’Keefe said. “Phantom of the Opera” performer Scott Mikita (Communication ’88) said his liberal arts background helps him “find the blood” in a scene or a role — in other words, uncover the humanity behind a part. Antonette Cohen (Communication ’06), currently a dance captain and swing in Broadway’s “Wicked,” said NU ensures that alumni of the theater program are “fully-formed” individuals with more than just pure talent. Cohen said she picked up a second major in psychology while studying dance at NU, and her non-theater classes gave her “nuggets of wisdom” to apply toward her career onstage. The alumni network is another factor that can help support former students in the theater business, Communication Prof. Cindy Gold said. Any theater is likely to have a “sea of purple” onstage and behind the scenes, she said, and among these successful alumni there is a strong ethic of “paying it forward” by helping fellow Wildcats. Jim Weitzer (Communication ’96), currently in “Phantom of the Opera,” said his career has benefited from NU connections. For example, he said Missimi — one of his former NU professors — cast him in a Chicago production that in turn helped land his “Phantom” audition. NU excels at building “bridges” to carry its alumni quickly from graduation to Broadway and other major professional houses, Young said. By bringing in successful alumni to engage with students, the school makes it so the world of professional theater doesn’t seem “big and overwhelming” to students, he said. This year, both “Hello, Dolly!” star Kate Baldwin (Communication ’97) and Actors’ Equity Association president Kate Shindle (Communication ’99) have offered workshops at NU. “Book of Mormon” actor Ben Estus (Communication ’13) said he found it comforting to have the “purple mafia” of alumni to support him in a new city, even if everyone was on separate journeys in different areas of the theater industry. Mikita said he found NU pushed him to take on roles outside his normal range. One particular challenge for him as an undergraduate was playing the role of Macbeth despite not being a “military type,” he said. Though he “never did it very well,” Mikita said he was determined to work hard at the role because it was one he would likely never play on a professional stage. To understand the character and the way a soldier would move, Mikita said he checked out a broadsword from the prop shop and then went to the beach. He waded knee-deep into Lake Michigan to get the feeling of being weighed down by armor, he said, and proceeded to swing the sword around, stabbing it into the sand to feign being in battle. That incident aside, Mikita said it was roles like Macbeth that challenged him to become a versatile actor rather than sticking to a specific type of role throughout his career. Amber Owens (Communication ’02), who currently performs in “Aladdin,” said she wasn’t actually part of the theater program at NU — she majored in radio, television and film — but still found the theater community to be a welcoming place and a “healthy outlet” for her. After spending much of her childhood performing with older actors and feeling like “one of the kids,” she said it was beneficial to spend time alongside her peers. O’Keefe said a main goal of the theater curriculum is to give students tools to become experts in their fields. In addition to that, though, she said she hopes students who graduate from NU theater walk away with essential tools for their entire lives.